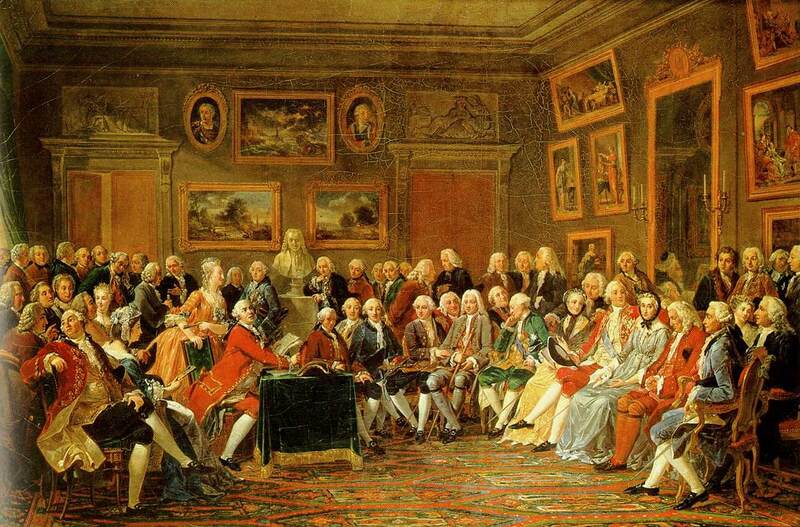 The idea of a Salon was developed in 17th and 18th Century France. Typically they were created and organised by the aristocratic ladies, to hear the ideas of the great thinkers of the time, to debate their meaning, for entertainment, because they believed ideas were important and because they wanted to know where the world was going, and of course to flirt. The Salon was central to the intellectual ferment of the end of 18th Century. They hosted the great thinkers of the time; Diderot, Rousseau, Voltaire. They were the scenes of excitement, outrage, and the shock of the new in a time when ‘the new’ still seemed possible. They signalled a time when the future was still an unwritten book. The East Midlands Salon is organised in homage to those days which only came to end with the eruption of the French Revolution and the arrival of a new constellation: the age of revolutions. Many historians think that Salons helped develop the ideas that ushered in that age.